If anyone that has not heard of de-thatching or your lawn guy just tells you to get it done yearly, there are some basic ways you can check to see if your lawn needs to be de-thatched before you go spending a lot of money to have it done. Although de-thatching a lawn can be done by a hand de-thatching rake, I would never recommended doing this unless you want to have an aching back after wasting a day. The most prominent way lawn care services de-thatch is by using a motorized de-thatcher also called a power rake. Obviously the ultimate goal for de-thatching is to provide you with a more healthy, lush, and green lawn. So how do I know if my lawn needs De-Thatching? 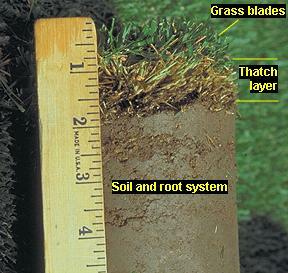 The most effective way to see if your lawn has excessive thatch is to take a shovel and cut out a small 6"x6" square of turf and examine if the area between the root system and the blades of grass. If this area has over a 1/2" of brown matted build up of thatch as shown in the picture, than it is time to de-thatch your lawn. A small amount of thatch is actually good for the lawn which help retain water and protect your grass from the harsh summer sun. If the build up is too much than it will prevent water, oxygen, and nutrients from getting to the roots. The best time to have de-thatching done for our cool climate is during mid to late spring when the lawn is actively growing and can quickly recover from the stress of de-thatching. More tips can be found once you determine if your lawn needs to be de-thatched. If you are debating between having your lawn aerated or de-thatched this season, take the quick five minutes to do this test and see if you have an above average thatch layer. Both aerating and de-thatching can be done at the same time and most lawn care companies in Reno like ours, offer more affordable packages if you choose to do both. I have found a good de-thatching video if you want a better idea of how it works.